And the results are overwhelming. 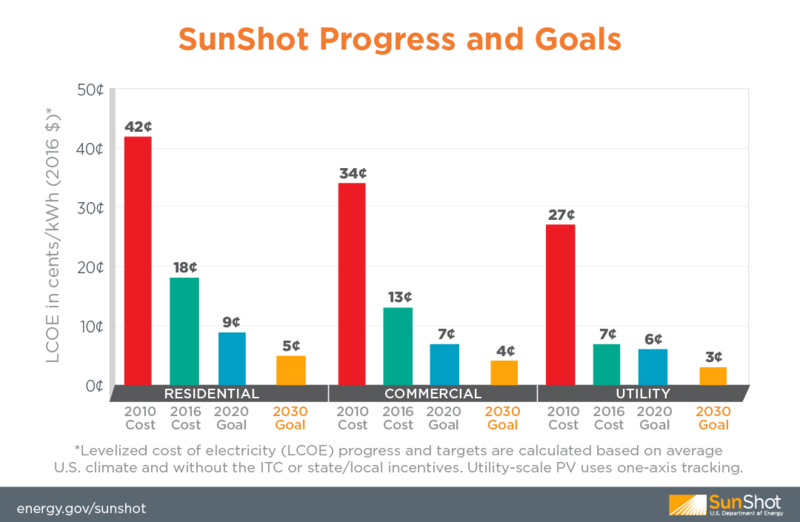 As of November 2016, just five years into the program, the solar industry is already more than 90% of its way toward achieving SunShot’s utility-scale goal and has also seen significant cost reductions in residential and commercial solar. Combined with other DOE initiatives, solar integration costs have declined 60% since the program started. The newly awarded $46 million is divided under two initiatives. The first is the Photovoltaics Research and Development 2: Modules and Systems (PVRD2) program, which aims to develop technologies to improve solar module performance, reliability, and manufacturability. Twenty eight projects have been awarded a total of $20 million, including both Fraunhofer USA Inc., Center for Sustainable Energy Systems and Massachusetts Institute of Technology of the greater Boston area. The second intuitive is the Technology to Market 3 (T2M3) funding program, which aims to accelerate the research and development of highly impactful solar energy technologies. Among the 20 projects awarded $25.7 million are Boston’s own Energetic Insurance and EnergySage, both working to advance solar deployment in the state of Massachusetts. For more information on the DOE’s SunShot Initiative and its programs click HERE.